Born in Puglia, also known as the heel of Italy’s boot, Giorgia is a classically trained musician, composer and multiinstrumentalist.Very early on she developed a strong interest for electronic music and started to experiment with new livetechniques. The solo project of Giorgia Angiuli stylistically moves between pop, techno and house. She uses her voice tocreate a dreamy dimension intensified by the use of unique toy instruments. During her set she combines keyboards,drum pad and theremin with the sounds of a toy flute, sax, trumpets and many other toys. Mixing all of these samples andloops she shapes a vibrating and energetic groove that sets the dance floor on fire.From 2013 to the present Giorgia has had success releasing on some of the biggest labels, Stil vor Talent, CrosstownRebels, Kindisch, Kevin Saunderson’s legendary techno KMS, Harry Klein, Einmusika, Systematic and Suara to name few. In2018 she released her EP “No Body No Pain” and in the same year her debut album ‘In a Pink Bubble’, both on the labelStil Vor Talent.When it comes to touring the globe, Giorgia is no stranger to the club scene. In 2013 when she began her solo project shestarted her residency at Tenax Club in Florence, Italy. Since then she has played at some of the most renown clubs in theworld including Berghain in Berlin, Output in New York, Rex in Paris, Hive in Zürich, The Egg in London, Harry Klein inMunich, Decadence in Kiev, Studio in Essen, Nox in Madrid, Le Showcase in Paris, Metro in Alicante, Privilege Ibiza,KaterBlau in Berlin, Sisyphos in Berlin, Watergate in Berlin, Wilde Renate in Berlin, Warung + D-Edge + Beehive + Club 88 inBrazil, Tenax in Florence, Le Bataclan in Paris, Tanzhaus West in Frankfurt, Artel Bessonnica in Moscow and many more.Oasis in Marrakech, Extrema Outdoor in Belgium, Fort Festival in Tossa/Barcelona, Altavoz in Venice, Elita in Milan,Electrowave in Florence, Fusion in Lärz Germany, Paradise City Festival in Belgium are just some of the festivals she hasplayed over the years.The start of 2018 saw Giorgia tour in Europe, Australia, South America and United States. She hit the European summerfestival circuit playing at Aquasella in Asturias Spain, Kappa FuturFestival in Italy, Fusion in Germany, Pleinvrees inAmsterdam, Rock'n Solex Festival in Rennes, Audioriver in Plock, Sueno Open Air in Aix En Provence, Zurich Open Air inZurich, Plages Electroniques in Cannes and Amnesia in Ibiza.As the years have passed Giorgia has increased her profile and visibility with her engaging online presence, it is no wonderevery video she posts goes viral receiving thousands or millions of plays. For a small town girl from Puglia, now residing inFlorence, this classically trained musician turned live electronic act is just getting started, so sit back and enjoy what’s tocome! Sarah Myers is widely recognized in the world of dance music as both a DJ and Event Promoter.As co-founder and resident DJ of “Life”, Sarah has helped to establish one of Washington D.C.’s most esteemed parties -- now into its fourth year.As a DJ, Sarah has played alongside some of the major players in today’s underground movement such as Matt Tolfrey, Jozif, Gavin Herlihy, Till von Sein, Clockwork, and Lee Foss. Sarah also hosts Hooked, a monthly podcast aired on DE Radio and TunnelFM where she holds residencies. It's featured past guests: Inxec, Bella Sarris, Ben Ashton, Randall M, and Chad Andrew. Born and raised in the DMV to a Caribbean family, KayLaSoul's love for electronic music has been deeply influenced by her cultural upbringing and stems from playing various instruments such as classical piano and saxophone for 10+ years. 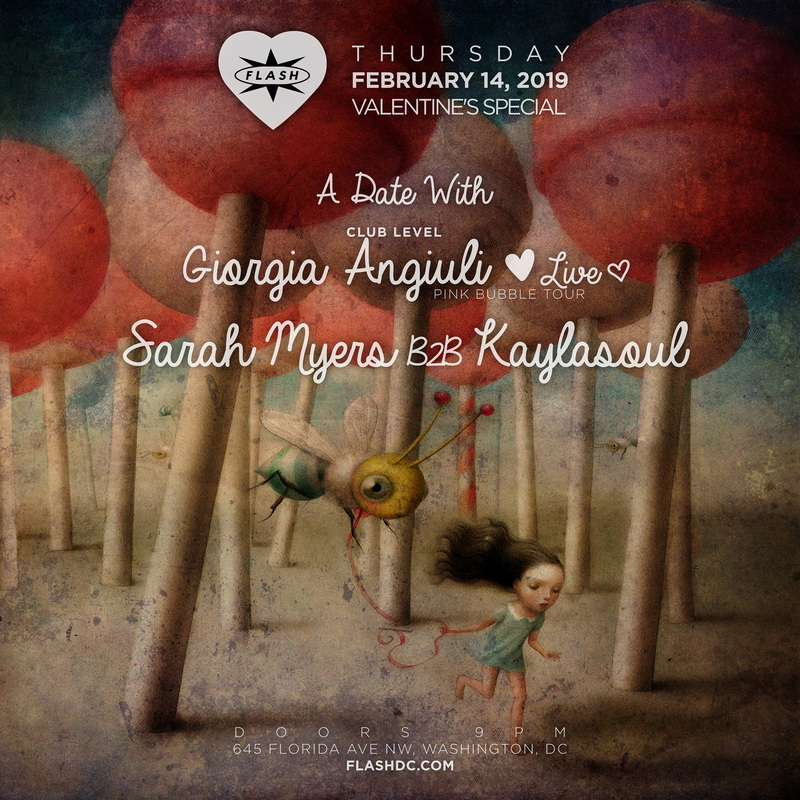 Although Kayla was a late bloomer when it came to exploring the underground house scene, she instantly fell in love with the art of song selection, beat-matching and production displayed by various local DJ's. She made her debut into the scene 3 years ago, shortly after attending a "Sunglass Sundays" party. Her unique and versatile style fuses underground deep house with minimal sounds, Detroit dirty techno, with a sprinkle of funk and disco. She grabs inspiration and tracks from artist such as; tINI, Cajmere, Axel Bowman, Daschund, pillowtalk and Nico Stojan to name a few.